It’s my eighth birthday today, September 10th, and I’d like to thank the individuals and organizations responsible for me being here. First of all, let me thank my mother, a stray cat on the streets of Camden, NJ. Then there’s the woman who rescued me as a kitten and took me to Furrever Friends, a no-kill animal shelter. Thanks, guys. They maintained a pet adoption center at the Pet Smart (bless them), and that’s where I ended up in a big cage with a tag that said “Bossy.” That’s where I first met Burnell and Betsy, the lovely couple who adopted me and became my personal assistants. Who knows what course my life might have taken had I not ended up with them. I am deeply grateful for all the love and care and inspiration they have given me the last eight years. I’d also like to thank Dr. Wellens and the wonderful, caring vets and staff of Queen Village Animal Hospital where I get my regular checkups. And then there are my many fans who have nurtured my time on this planet with their comments and compliments and expressions of love and appreciation. Thank you all so very much. There are two fans I’d like to send special thanks to: One is my licensing agent, Laura Becker of Moxie & Company, for her tireless efforts on my behalf. The other is composer/conductor Mindaugas Piecaitis, who saw the potential in my music and brought it to the concert stage through his creation of CATcerto. His marvelous talent and passion for music is an inspiration to so many. I would be amiss if I failed to mention my fellow adopted siblings: Max, Rennie, Clara, Gabby, Jenny, and Ellie. Though we have not always seen eye to eye, especially if they came too close to my piano (especially Max). I do appreciate the warmth and joy they have added to our home and to the lives of Burnell and Betsy. And a happy personal assistant is a good personal assistant. Happy Birthday, Nora. You are an inspirational to felines everywhere. Have a wonderful year. First of all, all best wishes for a wonderful birthday celebration filled with naps and unlimited tuna. Second, be careful not to bite the hand that feed you that tuna (in photo). Third, thank you very much for the “shout out” on your blog today–it’s always a pleasure to work for such a shining star. Remember that “bossy” almost always pans out. It’s just another word for “moxie”! Wishing you a most splendid birthday, your Royal Highness! From all 12 kitties in this house, and their Mom. We love you, Nora! Happy birthday, Nora. 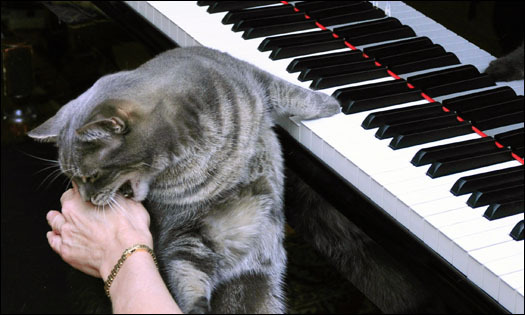 Your amazing piano playing, and just plain catness, has made so many people aware of the wonders of cats, and has probably prompted more adoptions. Shelters are a good thing indeed, but adoption is ao much better. Thanks for the smiles your exceptional music has brought to so many people over the globe. And thanks to your assistants for taking such good care of you and sharing you with us. Have a great year, and I hope you get some catnip and caviar for dinner tonight. Happy Birthday, Nora. And Happy Adoption Day to your assistants, Burnell and Betsy. The love you and your fellow felines give them makes their lives complete, I know. Happy birthday, my lovely and talented muse!